We offer the latest in fashion eyewear for all ages, styles and budgets as well as comprehensive eye examinations, contact lens fittings, and emergency eye care. We also offer laser/cataract evaluations and surgical co-management with the leading ophthalmologists. Please call us on our emergency line at any time of day and we will assist you with your medical needs. Please contact us for an appointment at our local office in Lincoln, CA. We are available during regular business hours and offer extended hours to meet your busy schedule. 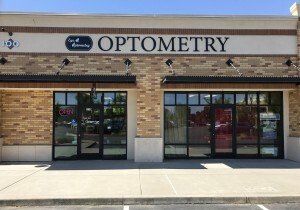 Welcome to Eye-Q Optometry, a full service optometry practice located in Lincoln, CA. We have a great new location at 100 Gateway Drive, Suite 130. Parking is available right out front! Browse our always updated selection of over 1,500 frames, including designers such as Ray Ban, Fendi, Versace, Tura, La Coste, Brendel, Nike, Randy Jackson, Joseph Abboud, Tommy Bahama, Konishi, Calvin Klein, Diane vonFurstenberg, Bebe, Cinzia, and LuLu Guiness. We have the latest diagnostic ophthalmic equipment necessary to perform comprehensive eye examinations including: threshold perimetry (visual fields), glaucoma testing, LASIK and other refractive surgery testing, and retinal evaluations for concerns such as diabetes, hypertension, and macular degeneration. We are proud to announce the addition of the iWellness Exam SD OCT as part of our Comprehensive Eye Exam. Stop by and inquire about this state of the art technology! Comprehensive eye health evaluations are vital to maintaining your vision and overall health. Our thorough exams create a baseline allowing us to detect changes from year to year in a fast and efficient manner. This makes it easier to diagnose and treat all eye conditions.